To Purchase Rosanna's Book, please click on the Paypal button below. You do not need a paypal account, you can either pay through paypal or by credit card through paypal. The total price you will be charged is $29.00 which includes shipping and handling worldwide. For other special collections which include the book, the six CD audio pack, and a drum and rattle of your choice, click here. Awakening the Divine Soul takes you on a fascinating journey. Rosanna's spiritual adventure introduces the many strange and amazing people she met along the way and the secret places where she throws herself wholeheartedly into the depths of soul. From a gathering of Inuit elders in an icy igloo, the journey begins to unfold. It continues with an incredible meeting with a spirit guide who assists her on the trail, to dark caves in Australia where she communes with an ancient teacher. Her shamanic journeying helps to unravel many mysteries: past lives in Egypt, Atlantis and the plains of North America and a lost key that is crucial to her personal empowerment, waiting to be collected in the Cornish village of Tintagel, England. Before we can embrace our future, we need to understand our own Cultural heritage. This book vividly demonstrates how important it is to know where we come from. "Awakening the Divine Soul will lead you to a life of fulfillment. Allow Rosanna's journey of self discovery lead you to yours." ~ Peggy McColl, New York Times best-selling author of Your Destiny Switch. Through a mixture of brave adventure and significant spiritual insight from a heartfelt experience, this book has a taste of Shamanism, involving Power Animals and Spirit Guides, yet also incorporates insight into Angels, Saints, Goddesses, Avatars and Crystal energy. "Rosanna brings the spiritual mystery of her unique and compelling shamanic journeys into clear focus through her beautiful retelling of her experiences, which are both insightful and deeply moving." Readers will reflect on their own journey and use this book, the 11 steps to finding their life purpose to seek their personal transformation and empowerment as they share in the unusual story of a modern woman's voyage into practical spirituality. "Shamanism is a profound way to enter into the mysterious and wondrous world of spirit. 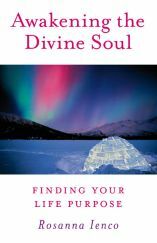 In Rosanna's book, Awakening the Divine Soul, she gives you stirring examples from her life - such as recounting her time in Greenland as she explored the shamanic traditions of that ancient land and recounting her own inner travels - to begin to open the door for you to embark on your own heartfelt shamanic journeys." Founder of the International Institute of Soul Coaching. "Rosanna Ienco is a gifted storyteller. Through sharing her personal story of how she discovered her wholeness and life's purpose she inspires us as well as shows us how to do the same. This is a great book." ~ Sandra Ingerman, author of Soul Retrieval and How to Heal Toxic Thoughts. It will give the reader ways to discover healing relationships, from parents to other family members and friends. Through various exercises, they will have the opportunity to look deep within and change any aspects of themselves they dislike and transform their old beliefs and attitudes. This will enable them to fully love themselves, embracing all that they are. "From the first few pages the author does the first essential when drawing in your audiance: she makes you start to understand her, identify with her, know her, and most importantly, care about her. This book has a strong sense of 'realness' and of 'rightness'. Follow Rosanna on her journey, and through the twists and turns of her experiences you'll become more and more emeshed with her spirituality. Then, miraculously, in the lanes and byways of this beautifully told story, you just might 'find' yourself." ~ Jenny Smedley, Past Life Consultant and Author of Souls Don't Lie. This book is for anyone who is interested in self-improvement, personal growth, and self-transfomation through spiritual means and for those seeking to understand their own soul's purpose. "When Rosanna asked me to endorse her book I was thrilled as I knew she was from Calabria, the most magical place in Southern Italy and my favorite place. I had no idea that I was going to be taken on a wonderful spiritual journey where I found, along the way, a parallel path and synchronicity. She describes fully her rich life and adventures in the spirit world, and has reassured me that we are all connected in this crucial time, if we listen to the signs coming to us. She has a clear way to make you part of the magic and shamanic journeys and practical exercises to find a way to connect to your true self and spirit guides. So you can follow "your bliss". Rosanna's book is A WONDERFUL AWAKENING TOOL worth taking with you on your special trips and keeping it by your bed to be used for morning and night meditations. Brava e grazie!" "I love this book! 'Awakening the Divine Soul' will touch your inner core, deepen your sense of purpose and stir your passion for life. Rosanna's journey is rich with emotion and full of clarity and insight. This book will fill up your senses and take you on a joyful ride to self-discovery and empowerment. Rosanna is a true healer, intuitive and sensing empath." 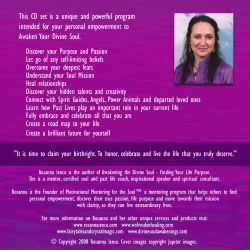 ~ Anna Maria Prezio, Ph.D., Author of 'Confessions of a Feng Shui Ghost-Buster"
"I love this book, it is so inspiring, as Rosanna invites you to come along and then venture out and have a journey of your own! I thoroughly enjoyed reading it, from cover to cover, all the way through - what a fantastic journey! For me it was hard to put down. I love the interactive quality in the exercises suggested after each chapter and also at the end of the book, inviting the reader to come along, explore their own journey and play." "As the owner of a small, independent book store, I have always been supportive of the creative process, especially of those whose narratives somehow serve as guidance along our life paths. Rosanna has come through with a little gem of a book. It is her personal, shamanic journey through re-capitulation, healing and transformation. We are all seeking fulfillment through life purpose. We want to know we can make a difference, no matter how small. 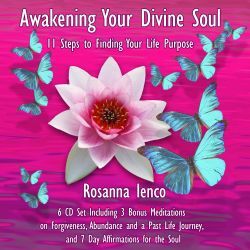 Awakening the Divine Soul not only takes us through Rosanna's magical experiences; it additionally offers a step-by-step guide for transforming one's own life so that we can begin to find our individual sense of direction and purpose." Buy Rosanna's 6-CD series for only $75 including shipping.